Lauren Beacham's otherworldly pendant features the phase of the moon from your date of choice. Long a celestial symbol of the feminine, the moon makes a lovely metaphor for motherhood in Lauren Beacham's personalized pendant. 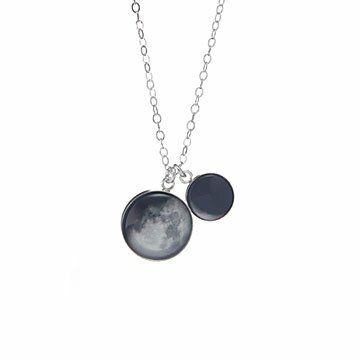 Specify the date and time zone for any mother and child's birth dates, and Lauren will set images of the moon's phase from those days under glass within sterling silver bezels. Add up to three more small moons to represent the children in a mom's orbit. Handmade in Maryland. Item is not waterproof - please avoid getting wet. To clean, use a soft dry cloth. To prevent tarnishing, store in an airtight plastic bag when not being worn. This product is so unique!!! Beautiful and unique idea. I would love to see a ring!!! Very good quality, I'm really happy with how it turned out. My stepmom loves the necklace, and it fits her really well. So far i don't have any cons about it. This necklace is so pretty and unique. I just love it. One small flaw is that itt doesn't always lay flat. I have 3 moons on there. Chain is so tiny and lightweight, that the knots could not be removed without breaking it. also, charms are not attached to the chain so that they stay separated, so they just hang in a lump. No one can see the images on them. My daughter loves this necklace. The only slight problem is that it's not waterproof. She hates to take it off! I was a bit disappointed in the small size. It is difficult to see so it doesn't draw attention like I had hoped. Otherwise it's well made and a unique gift. But didn't have the impact I was wanting because of the small size. It was really cool to find out that both my wife and daughter were born under the same moon. I also like that when we have another kiddo I can buy another set and take the little moon out to combine it with my wife's current necklace.